FS Private Wealth - The Journal of Family Office Investment is the definitive source of up-to-date and relevant reference articles, case studies and thought-provoking opinion pieces for the Australian family office and high net wealth community. The Journal is supported by the Financial Standard 'Developing Excellence' CPD Program. This web-based program is one of the most innovative CPD programs in the industry and has been specially designed for individual and corporate use. 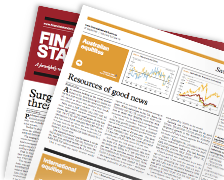 FS Private Wealth - The Journal of Family Office Investment is produced as a weekly online newsletter and as a quarterly magazine: March, June, September and December editions.